The initial claim relates only the first two maps and it therefore completely miss the point. By stating that gun ownership is reducing the crime rate, it basically does nothing more than stating gun ownerships and richness are strongly correlated, and that poverty is the main reason behind the homicide rate. What that means is that it’s certainly not the main factor. From this table, we can clearly see that countries having more guns have higher crime rates. 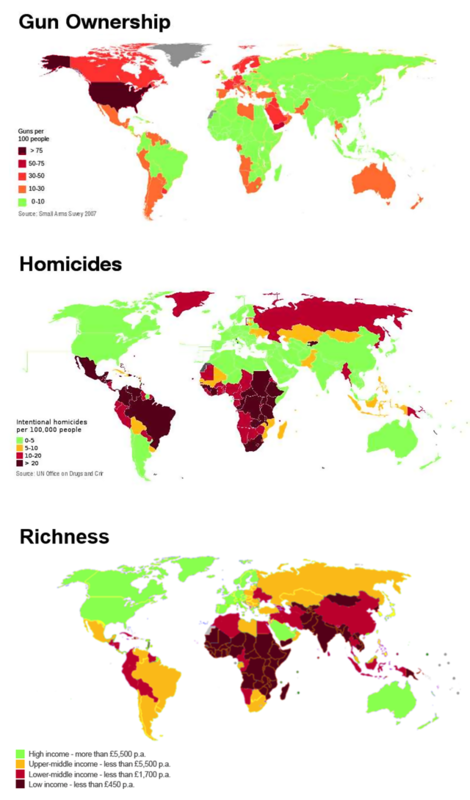 And, in most cases, the countries having more guns also have a slightly more important average income than their neighbors (which explains why they have more guns). It perfectly validates the whole model. As a conclusion, I think it’s safe to conclude that if you give easy-to-use killing weapons to the population, you increase the homicide rate. It’s exactly what you would expect.